Our action has started to pick up a bit, but it is still hit and miss. We are still running into groups of cows all by themselves. I have typically found that somewhere between Sept 15th-20th the big bulls start to get real serious about finding all the straggling cows, and those days are magical when you hit them. After those magic days, when the bulls have their cows, they don't want a thing to do with another bull. They'll bugle back until they lose their voice, but each bugle gets further and further away. Once that happens you'll need a jetpack to keep up with the herds. If you can get out now, get out now! My brother has amazed me twice this season. I'll tell you how. Danny, his girlfriend Ashley, and I snuck our way in front of a group of elk last week. We heard the bull bugling from an aspen ridge in front of us. We quickly hurried around them and got on the back side of the ridge, where we figured they would be going. We were right. The bull bugled a few more times allowing us to get set up in the perfect position. Danny and Ashley sat together, and I was 50-75 yards off to their right. Ashley only has a cow tag this season. Danny and I each gave a few very soft cows calls, not to call the elk in necessarily, but hopefully just nudge them in our direction. It worked like a charm. Within a few minutes Danny and Ashley had cows milling all around them. The bull was rounding up the back, and he was a dandy. Ashley started to get out of Danny's way so he could take a shot at the bull. This is the first time Danny amazed me. He did it with his selflessness. That bull was a stud, as big as the one my Dad killed this year. A massive 6 point. 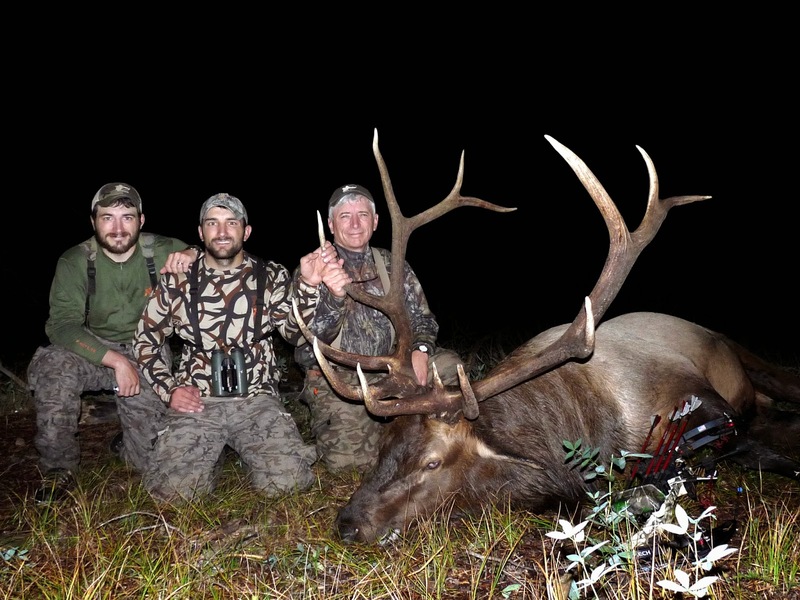 We've hunted our entire lives, and we are finally good enough to play this situation exactly right and get a bull like that in shooting distance. When Danny saw Ashley getting out of his way he instructed her to stay put and take the first shot that presented itself. The bull and a cow both started walking into an opening 20 yards away. A shot at either or both was imminent, and Danny told Ashley go ahead and shoot at the cow. I was out of sight of all of this, so all I heard was the thundering of hooves. I waited a few minutes and made my way over to them. Ashley was visibly dejected, she missed. I got the whole story, and before Ashley could apologize again Danny cut her off and said, "Hey, it's just a stupid elk, don't worry about it". Amazing act of selflessness. And now for the second time that Danny amazed me this season. The following day we had some rain and fog roll through. The perfect time to get out all day. 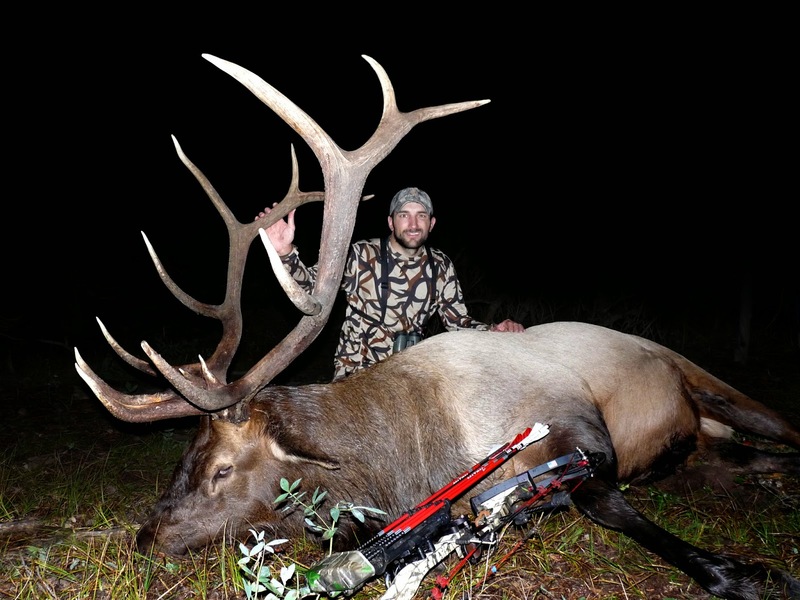 Danny was hunting by himself and planned on hitting a few aspen ridges that the elk frequent. As he was sneaking his way through the forest he stepped on the smallest of branches. Movement from his right caught his eye, and as he looked he saw a huge rack swinging around. A big bull was bedded just 20 yards away, facing the opposite direction. Danny was pinned down, but thankfully a giant log was covering him from the bull's view. All Danny could see were two big antlers poking around both sides of the log. He was in a compromising position but he held still. Danny glanced at his watch, 5:05pm. He never really believed that shot would present itself. The wind never holds out, and the bull obviously heard him step on that small branch. But finally, after what seemed like an eternity, the big bull turned his head and looked the other direction. It was now 5:35pm. That bull did not move for a full 30 minutes. Danny slowly brought his feet together and did a few small knee bends to get the blood flow moving again. He worked an arrow out of his quiver and took a step to his left in order to get a good view of the bull's body. He studied the bull for a few minutes. Initially, he didn't think that a shot was available. But after closely looking at the bulls position he saw where he could place an arrow. Ever so slowly Danny contorted his body in order to get his bow back. I mention Danny's shoulder a lot in this blog. It's been 3 years since he has had a functioning shoulder. 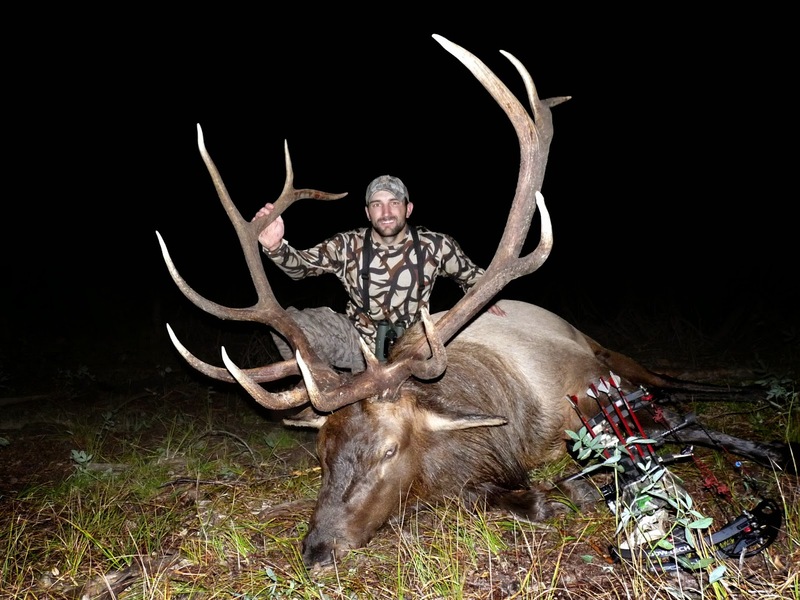 Twice, in his awkward position, he yanked on his bow string to try and get his light weight compound pulled back. Finally, on the third try, he painfully got the bow to full draw. Danny shot. The bull took a long time to get to his feet but once he did there wasn't a tree or stump big enough to slow him down. The bull ran through EVERYTHING to get out of there. Danny glanced at his watch again. 6:10pm. It took him another 35 minutes to get an arrow out, take a step, study the bull, and get a shot off. Over an hour after he first saw the animal. A short bloodtrail later and Danny found his elk. The bull was too big to move with one arm, Danny made his way to an area with reception and called Dad and me to come give him a hand. We both left immediately. Three and a half hours after his phone call we hit the closest trailhead and started our long night of cutting and packing. Danny's selfless act, and his ability to slip in on a big bull in his bed, have added to his legend in my mind. My little brother always blows me away in the woods. A big thanks to Aron Snyder and the guys at Kifaru for getting Danny and I set up with new packs this year. A hind quarter never felt so easy! I still love my Hornehunter, like what my Dad is using in the picture above. But I am a small guy and the Kifaru fits me properly. I never would have guessed what a difference it would make. I drop my wife and kids off at the airport in a few hours, they are going to visit my in-laws in Wisconsin. Since my Dad and brother have both killed nice bulls this season, and my family is out of state, there ain't a force on earth that will keep me out of the woods for the remainder of the season. Good luck everybody! I sure hope to have one more good story this elk season.